●To meet the power and torque requirements of enthusiasts, the high output 850MX motor was born in Align’s R&D lab. With dramatic increase in torque and power output, capable of 5100 watts continuous power output and 11000 watts of burst power! ●Inherit from the previous 800MXs feature, high efficiency, superior power, excellent torque, low current draw and low temperature. It’s capable of maintaining much more consistent torque and head speed through continuous 3D maneuvers, which is particularly special design for 3D flights. 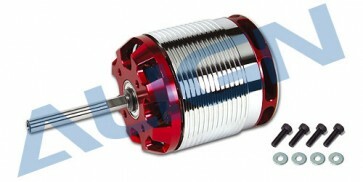 ●850MX motor incorporates radial fan in its end bell, creating powerful airflow to dissipate heat. Tweaks to motor design and reduction in weight not only contributes to dramatic power increase, the high efficiency cooling system enables cooler operating temperature during and after flights when compared to motor of previous generation. ●The 850MX motor armature are dynamically balanced to eliminate typical imbalance found in other outrunner motors. ●Suitable for T-REX 700E 、T-REX800E series helicopters and other 700 level models. ●When using the motor on T-REX 700E, please use 110T main gear with 13T motor pinion. ●When using the motor on T-REX 800E, please use 112T main gear with 12T motor pinion.